Ling-Huey Carter is this week's winner of a ¥5,000 gift card to Anchor Shoji a specialty shop for kitchen utensils. She is from Hawaii and has been on Okinawa only two weeks. Although she has not had time to see much so far, she says that Okinawa is very promising considering her interest in scuba diving. She also likes to read and cook on her free time. June Flood was born and raised on Okinawa. 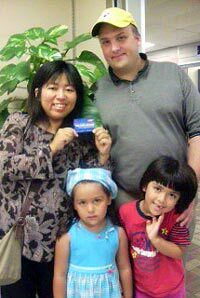 The Okinawa City native is this week’s lucky winner of a $50 SoftBank New Military Access telephone card. Besides her family, her passion is quilting, for which she dedicates her free time.